These mini crustless vegetable quiches came to be after I needed a quick lunch last week. My impending homelessness has made me be a bit more frugal with my food shopping and that means getting inventive with left overs so I set about seeing what else was lurking in the fridge after I finally used up the left over mincemeat and rustled these up. They fit the bill of a healthy lunch that would provide packed lunch left overs for the following day. You could use any leftover bits for these and omit the pesto if you don’t have Mediterranean style veg to hand. Pre heat oven to 180c or gas mark 5 and divide a sheet of parchment paper into 6 squarish rectangles. Push into the muffin holes using a glass slightly smaller than the holes to make your own tulip cases. Lightly fry the pepper and courgette in a small frying pan with a little oil until softened. Break the eggs into a jug, add the milk, salt, pepper and pesto and whisk to combine. 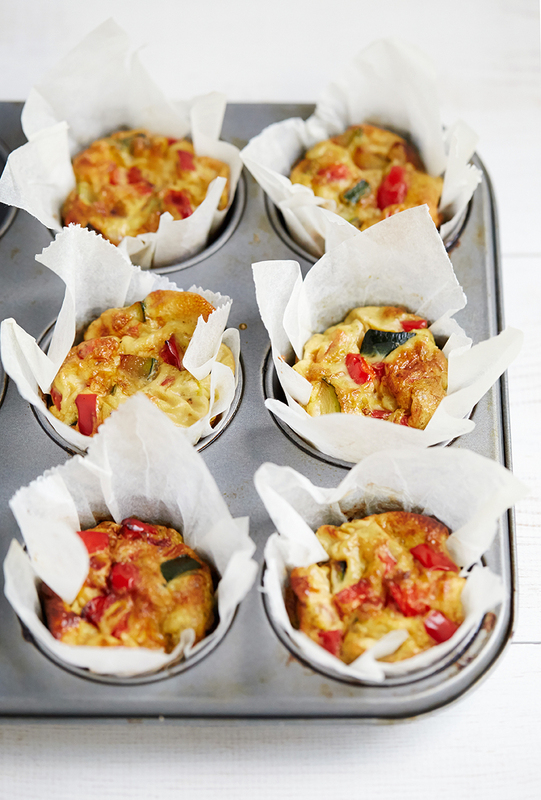 Pour the egg mixture equally between the 6 lined muffin holes, add a sprinkle of cheese to each one and then a couple of spoonfuls of the veg. Transfer to the oven and cook for 15 minutes or until the quiches feel firm to the touch and are lightly golden.